Sorry... the 2017 Buick Envision is no longer being sold as new. Instead, take the first step to a great deal on 2019 Buick Envision with a free price quote! 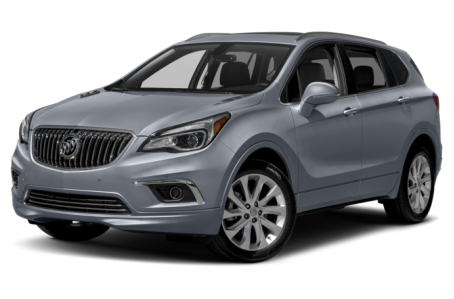 The 2017 Buick Envision is a mid-size SUV that seats up to 5 passengers. It competes with the Ford Edge, Chevrolet Traverse, and GMC Acadia. This year, it gains a new base engine, 3 new lower-tier trim levels, and a Teen Driver Mode allows parents to set controls, review driving habits, and encourage safe driving habits when the teens are driving by themselves. Five trims are available: the base model, Preferred, Essence, Premium, and Premium II. Like other Buick SUVs in the lineup, the Envision has a sporty, yet bulbous appearance. The front-end features a large grille with curved vertical slats. Sharp body lines run across the sides of the Envision. Chrome accents adorn the exterior, giving it a more premium look. Standard features include automatic headlights, daytime running lamps, body-color power/heated side mirrors with turn signal indicators, a hands-free power liftgate, and 18-inch aluminum wheels. LED signature lighting is also available. Under the hood, the Envision is powered by a standard 197-hp, 2.7-liter 4-cylinder engine mated to a 6-speed dual-clutch automatic transmission and front-wheel drive. All-wheel drive is also available for the Preferred and higher trim levels. The Premium and Premium II trims are equipped with a more powerful 252-hp, turbocharged 2.0-liter 4-cylinder. Fuel economy for the 2.7-liter models is an EPA-estimated 28/34 mpg city/highway. It lowers to a 23/30 mpg rating for the Turbo 2.0 models. Inside, the Envision has a premium leatherette cabin with a 60/40 split-folding rear seat. The center stack features the Buick IntelliLink multimedia system, which includes an 8-inch touchscreen, Bluetooth connectivity for phone and audio, Apple CarPlay/Android Auto compatibility, and two USB ports. It can be upgraded with an integrated navigation system, 4G LTE connectivity with Wi-Fi hotspot (subscription required), and a Bose premium audio system. Standard features include dual-zone automatic climate control, cruise control, power/heated front seats, power windows/locks, remote keyless entry, push-button start, and remote vehicle start. Available features include perforated leather upholstery, ventilated front seats, heated rear seats, and a heated steering wheel. Standard safety features include a backup camera and a tire pressure monitoring system. Available active safety features include lane keep assist, front park assist, lane change alert, rear cross-traffic alert, full-speed range adaptive cruise control, collision mitigation braking, automatic park assist, a surround-vision camera system, and the Safety Alert Seat, which pulses to alert the driver about a possible crash. 34 of 34 (100%) consumers said they would recommend this vehicle to a friend.